I will be using these for food leftovers that will go in the freezer. I don't know how many times I have thrown food out because I didn't know what was in the container. There are so many of them I am sharing with my family. I would buy this again for certain! I was surprised that it stuck to a package of food that was already frozen in my freezer. I've used these labels for years and just reordered them. So of course that means I liked them. I cannot live without these labels. I used them for Tupperware containers going into the refrigerator. I keep a strip of about 10 blank labels on the refrigerator door so they are handy. I was glad to find a label designed for use in the freezer. Labels at the store were either too big or too small. I wanted label that would not come off in freezer THESE WORKED! Handy for keeping food separate when freezing my freshly caught food/meat. I have recently bought a Foodsaver Vacumn Sealer and when using the roll to make my own bags, they don't already have a special space to write the contents. Now I can have an easier place to put the contents then trying to write on the bag itself. Works for me. nice and sticky when in freezer! I LOVE THESE LABELS SO MUCH!!! i use these at work daily! they stick to all of my varied storage containers and squeeze bottles, even when they are cold! they even stick to the styro to go containers, i LOVE them! Really enjoy not to guess whats in the frrezer.Labels stay on my product and there is no second guessing what it was. These labels are easy to use and functional . Any pen or marker can be used to clearly label frozen foods. The size of the label is just perfect. They stay in place and do not peel off.This product makes it easy for me to find items in the freezer, to easily Identify the contents and know exactly when the product was frozen. These labels have saved me time and money. I would definitely recommend them to others , who want to do the same. really sticks well in freezer. Great for labeling anything that needs one. Love these!! Perfect for storing away those leftovers! These are great! Now we dont have to guess whats in each container! These make containers of left overs easy to find in the freezer and are excellent for items from the garden adding dates as to when to use. I bought these labels because I was tired of searching for paper and scotch tape to put on my containers of leftovers. These labels work great and are a good size for all containers. No more wondering when I last used the leftover spaghetti sauce, gravy etc. I just pull out a label, stick it on and write the date or whatever on it. I was so tired of tearing off masking tape to label my freezer foods. This is just perfect! I love being able to identify the contents of my leftover food in my freezer and refrigerator. With these labels, I can put the name of the contents and the date that I made it so I'm sure to use it up before it spoils. Wonderful product! saves time searching for frezzer items and refrigerated food. These labels are perfect for the Food Saver bags. I identify the food and freezing date. We no long lose food because we can't identify them or because we went beyond the acceptable use by date. This is the 2nd time I've ordered these. They stay stuck to my containers in the freezer but are easy to wash off when I need to. I freeze a lot so I use them often. Plenty of room for contents and date. I have used these labels for years when I come home from grocery shopping I can attach these labels to my canned goods. It helps when I go shopping next to note if the price has gone up since my last purchase of a particular item. I had been using freezer tape to mark my storage containers. Very messy and many times the tape went bad before I could use it up. The freezer labels are easy to write on, don't smudge and stick beautifully to the containers! And, at 500 on a roll, they are very economical! I had problems writing on things I freeze. Now it is a breeze! I love these labels for identifying food in the freezer. They stick well. This is the second time I have bought these. By writing the name of the item and dating it, products in freezer can be kept safe. I love these labels! They really do work! I use them for all kinds of labeling, not just for the freezer. They adhere best if the item you place it on is nice and dry. I am very pleased with this purchase. Great labels and terrific value. Just go a food saver and use on the bags for the freezer. I use these labels very often. These are great to use on freezer containers. I write the product name and date on them before placing in the freezer. These labels stick on almost anything and last as long as frozen items are kept in the freezer. I bend a corner under and it facilitates removal without sacrificing too much writing surface. Even when not using it on items stored in the freezer they come off clean 90% of the time. If they are removed immediately upon removal from the freezer, they always come off clean. The labels do not come apart in the frig or freezer. They retain the writing on them. They are easy to peel off and paste to any surface. I use the labels on the foods I cook ahead and freeze for later. My Mom is 90 years old and was distraught that she had run out of her supply of these great freezer labels. It was WONDERFUL to find them online [...]. Now she is happy and set for awhile.My Mom is a former librarian who loves things organized and labeled. Having these in her home brings a lot of joy into her life and that's a PLUS no matter the age! Thank you for providing this TERRIFIC product! I freeze a lot of food for dinners. The product and cost are good. I just wish they would tear evenly easier when needed. They do exactly as they say. I use these labels for more than just for the freezer. They stay on so well that when I need a good label, I use these. 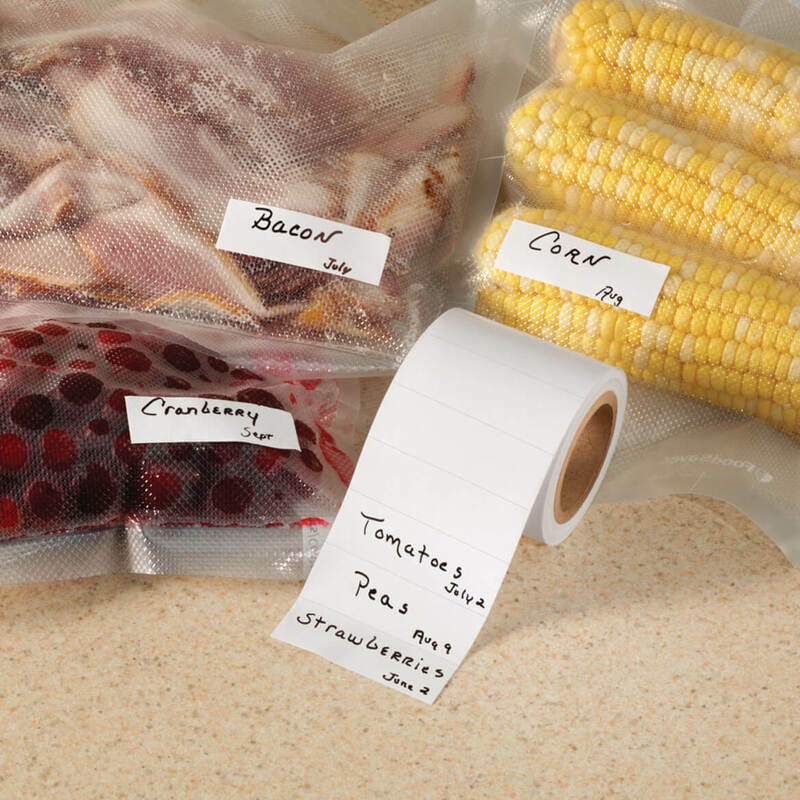 These labels are great for storing left-overs in the freezer. I always know how long something has been in there. And they stay attached to my containers. 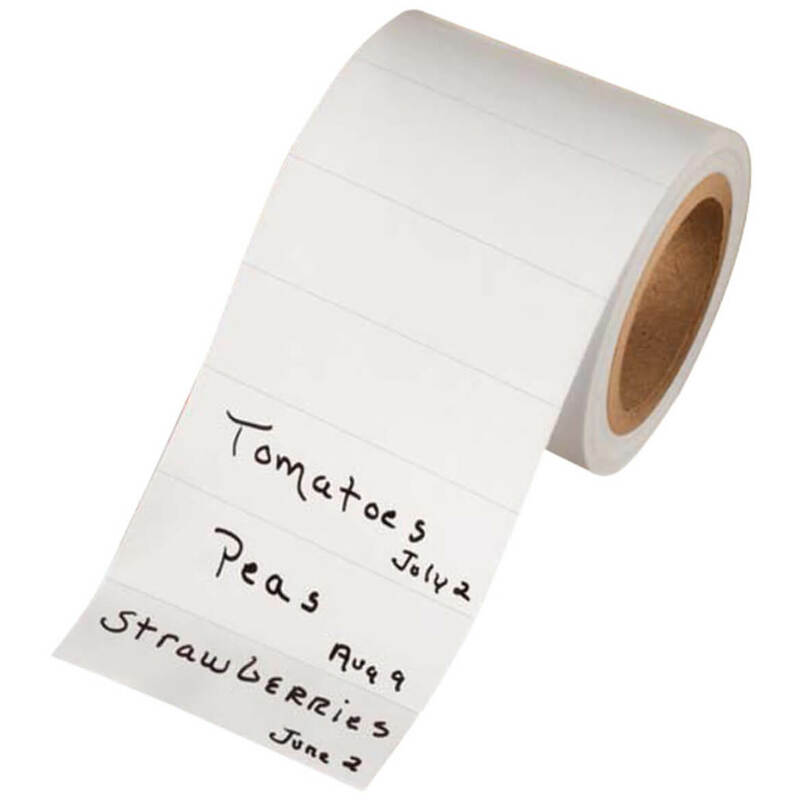 Used to label frozen foods, individual labels, just pull of the roll and use. Easy! Easy to store. These don't fall off in the freezer !! When we go shopping and buy meat, these labels come in handy to put on the freezer bags. I put the date and what it is. The label stays on the package good even when it becomes frozen. And the cost can't be beat, I searched, but could not find any cheaper. Ample size, so sometimes half is enough. Stays on in freezer. I use many plastic freezer storage containers, and sometimes the label peels right off, but sometimes it leaves sticky residue that has to be treated with adhesive remover. I haven't figured out if it's dependent on length of time in the freezer, condensation during defrosting, or age of plastic container. The best lables to use for identifying frozen leftovers. Will be able to label for years! Have just started using these so can't speak to how well they stay on. There are so many in a roll that I am sharing with my daughter. LOVE THESE LABELS, GOOD FOR ALL THE STUFF IN THE FREEZER. Used them for storage containers and they work great. Great for patching my shooting targets. just cut in 1/3's. use a black marker where needed. Using to label foods in freezer containers but glossy paper is hard to write on with most pens, labels are hard to peel off roll, and hard to get off containers after use. Would have been nice if they came in a box that could be used as a dispenser. Labels are also a bit small. I bought this to label and put on plastic lids of storage containers and even though they stick, once you are done and try to remove them, they are almost impossible to remove. Will probably just use them for things that do not require reusing like foil, plastic wrap, freezer paper and others. These are great on FREEZER bags, but put don't use them on plastic or glass unless you have time to soak to get them off or plan to throw out what you use them on. This produce has adhesive. The labels I have now do not have adhesive. So I can identify items I put in the freezer. I BUY MY MEAT IN BIG PACKAGES AND THEN I PUT INTO SMALL AND LIKE TO MARK DATE ADDED TO FREEZER. Need them. Ran out of last supply. Like these a lot! I've used these for years. Great for labelling freezer items. THIS WILL HELP KNOW WHAT IS IN FREEZER CONTAINERS. I needed some for summer freezing of fruits and vegetables. Used these for years. Everything in my freezer is marked. No guess work on what's inside. Always label things in the freezer so I know what they are and the date. Need to know what’s in those containers. I have used these freezer labels for many, many years. They adhere beautifully and are the perfect size. I have had these labels before and ran out of them., I use them for many things not only for freezer labeling of frozen foods. Paper and tape just st doesn’t stick well in items in the freezer. Hoping these will do the trick! Have used these before and they perform! I use these to be able to know what it is. I find these labels very useful for items I freeze. I like being able to list what the item is and include the date. They stick very well on freezer bags and I have never had them come off. These are the best thing for keeping track of frozen items. Tired of not having a clue as to what is frozen! These labels don't smear or run. Can be used with markers or ink. Excellent. Stay on items in freezer for months. . I needed them. Hope they work! to label every item i put in the freezer. It will make it easier for me to find the item i am looking for. You can't write on foil with any kind of pen and regular tape won't stick. I really need these! Very convenient. I use them for marking containers in the freezer and other areas. I use these alot and they stick well. I fill my freezer with in season foods and use them to label each item. How easy is it to remove the freezer labels from plastic or glass containers, and do they leave a residue where the label was? BEST ANSWER: These labels stick very well to plastic containers (which I use in the freezer) and the labels pull off easily and there is absolutely no residue (stickiness) left on the plastic. I always take the label off as soon as I take it out of the freezer, it peels off very easily and have never had any problems getting the label off. Hope this helps - plus the labels are a big enough size that it easy to write to indicate what is in your container. Sometimes you can soak them off with soapy water - if not, spray some Goo Gone where the label was. It's great for removing most residue from any labels. Love these labels. Usually peel right off or wash off with warm water & soap. Stick well in freezer and don't fade or run. I pull off the label and if there's any residule I scrap it off. Or just put another label over what's left. I have not had a problem removing them. They usually soak right off in warm water. Hope this helps. The labels come off very easily and don't leave any residue. They are wonderful! Are they removeable from containers? BEST ANSWER: Definitely and are easy to apply and take off when needed - even when put in the freezer. Have been using these labels for several years and love them. I live in Colorado Springs and my sister in California. Sent her one roll several years ago and she also loves it and wanted me to send her more. We both love it. Absolutely - I've stuck them on zip lock bags, canning jars (both on the glass and lid), on aluminum foil. They're great. On some containers they come off. The longer their on the hard they're harder to get off. NO, but I don't worry about it. I just put another one over it. They have been for me! I really like them. is it possible to print on these labels? BEST ANSWER: Thank you for your question. Yes but sharpies work best. We hope this information will be of help to you. I print my labels with a Sharpie permanent marker or ball point pen. They're definitely not appropriate for a printer. will it stick to cold plastic containers that are already in freezer ? BEST ANSWER: Thank you for your question. They should. The description states they stick to just about anything. We hope this information will be of help to you. BEST ANSWER: These are plain white labels and not see through. No background showing through. These labels are thick. No see-through at all. Thick. I could not see through mine. Will the labels remove with one pull from freezer BAGS without leaving any residue? BEST ANSWER: Thank you for your question. These labels will leave residual glue on your bags. We hope this information will be of help to you. Never had any problems removing label from freezer bags or even on top of canning bottles. No residue whatsoever - very clean. Yes and it does not leave residue. BEST ANSWER: Thank you for your question. Yes this item comes in a set of 500 and you may order more then 1 set. We hope this information will be of help to you.